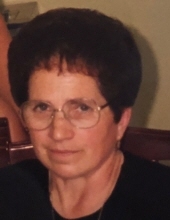 Carmen Alvarez Fernandez Rodriguez, 75, passed away at Care One at Livingston, LTC, Livingston, NJ on Sunday, October 21, 2018. She was born in Orense, Spain and resided in the Ironbound Section of Newark. Carmen was a Seamstress for many years. Wife of the late Jose Rodriguez; devoted and loving mother of Miguel Rodriguez and the late Jose Manuel Rodriguez; dear sister of Maruja Feijoo and her husband Jose and of Miguel Alvarez; cherished aunt of Ana M. Gonzalez, Jose M. Feijoo, Monica Alvarez and Elliana Alvarez. To send flowers or a remembrance gift to the family of Carmen Rodriguez, please visit our Tribute Store. "Email Address" would like to share the life celebration of Carmen Rodriguez. Click on the "link" to go to share a favorite memory or leave a condolence message for the family.